Coldfeet, a grade school teacher in Long Island, NY happens to be covering a 2nd grade class today, student's showed him this book. 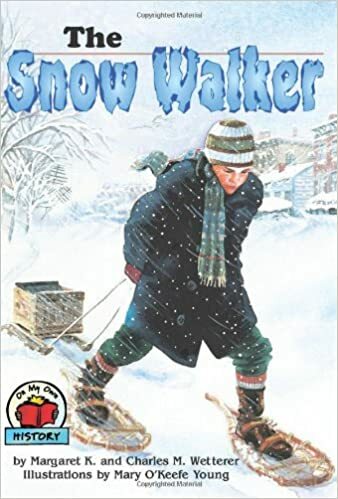 The Snow Walker: Describes the adventures of a twelve-year-old Bronx boy who ventured out on homemade snowshoes to help his neighbors during the Blizzard of 1888. I hope he has a blast. You also, of course, but he seems to really want to escape the tarred section of the planet for a while. Hey Trapmusher, your exactly right. I need that good old nature medicine. Check out that video of the guy bike riding in the Artic! Oh man. I would love to experience that but in a much smaller time frame. I actually told my wife that this coming journey in a few weeks is a tune up for Canada next year. Bio, I planted the seed in her head! Slow and steady, take pics and enjoy the views, that's all I need. Best to all.